Spray large nonstick skillet with nonstick cooking spray. Add chow mein meat; cook over medium-high heat for 5 to 7 minutes or until browned, stirring frequently. Add celery, carrots, onion and bell pepper; cook 2 minutes, stirring occasionally. Add broth, stir-fry sauce and sugar; stir to mix. Cook over medium heat for 8 to 10 minutes or until vegetables are crisp-tender, stirring occasionally. In small bowl, blend water and cornstarch until smooth. Add to skillet; cook and stir until thickened. Meanwhile, cook noodles to desired doneness as directed on package. Serve pork mixture over noodles. Sprinkle with cashews. 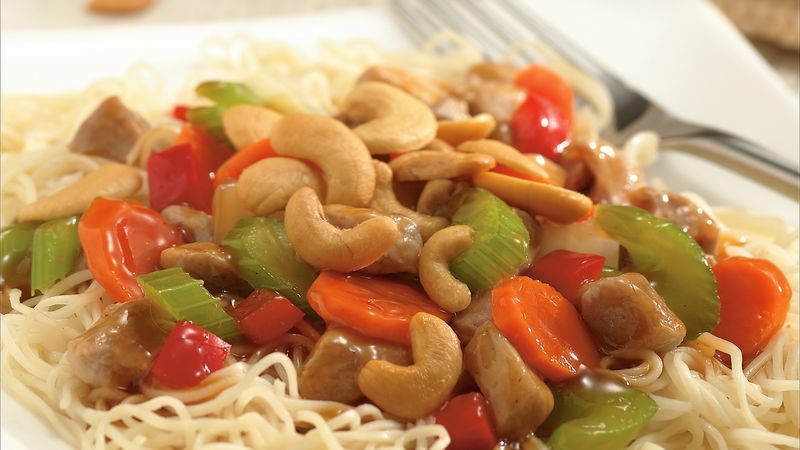 Chinese noodles are similar to ramen noodles; look for them in the grocery store in the Asian foods section. Try ground turkey or chicken in place of the pork. Ramen noodles, egg noodles or angel hair pasta can be used in place of the Chinese noodles. To streamline the recipe, use frozen chopped bell pepper and onion, or try a purchased vegetable mixture for stir-fry. Stir-fry sauces vary in flavor; after chow mein is finished cooking, taste it for seasoning and add a bit more sugar if desired.